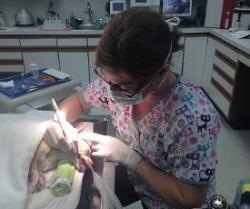 We provide complete dental care for your pet. At each visit our doctors will evaluate your pet's mouth for any signs of dental disease. Red gums, heavy tartar accumulation, bad breath, a decrease in appetite, and pawing at the mouth are just a few signs of dental disease in pets. Our preventive dental health care program is based on the specific needs of your pet. Did you know... good dental care can lengthen your pet's life by 10-20 percent? Besides preventive measures to decrease tartar accumulation, we also provide professional dental cleanings when necessary to keep your pet's mouth healthy and comfortable. General anesthesia is required for a professional dental cleaning to fully evaluate your pet's teeth. All of our patients receive pre-anesthetic blood work to ensure their safety under anesthesia. We use the safest forms of anesthesia and pain control available. In fact, most of our anesthetics are exactly the same as the anesthetics used for elderly humans. In most cases, even geriatric pets and pets with chronic diseases can be safely anesthetized to treat their dental disease. Did you know that most of your pet's dental disease is below the gum line where we cannot see it? With dental x-rays we can evaluate each and every tooth for any signs of infection or disease. Once anesthetized, your pet’s teeth are ultrasonically scaled and polished. Our doctors can then fully examine the teeth, record all problems, and determine an appropriate course of treatment for your pet. After the teeth are cleaned, they are polished and are treated with fluoride just like at our human dental cleanings. Once fully awake, your pet can go home the same day and resume normal activity. Our veterinarians will provide you with a care plan for home maintenance, which may include specific foods and treats, as well as brushing your pet’s teeth. A Clean Mouth is a Healthy Mouth!